So, what can we expect from all the budding Sonic Fan Game developers then? It’s a good job we’re here – take a look after the jump. 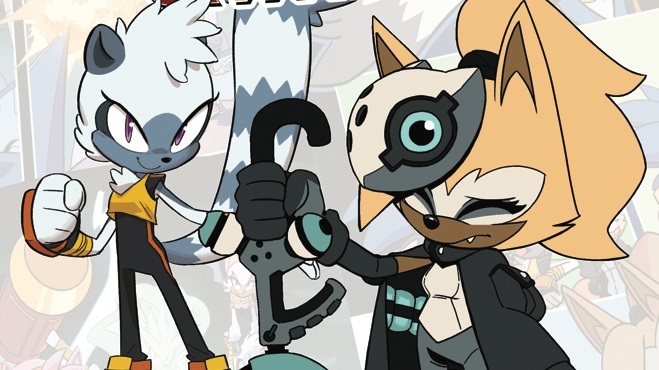 In good old Blaze’s booth, a game titled Sonic: The Fated Hour [ABOVE] is showing and features Sonic as the VICTIM, rather than the hero. All of the familiar Sonic items are here, and the sprites have been modified to suit the new look Sonic too. A cool appearance from Shadow (Sonic Adventure 2) is here also. Check out the booth for a demo. It rocks. A Sonic fan game group called Sonikku Team have presented visitors with a nice little page with information on their new project, Metal Sonic Quest 2. No screenshots were released, but you can still download it at the page. Gameplay is currently putting together a game called ‘When Tails Gets Bored: Special Edition‘ [ABOVE]. You all know the famous hoaxes that can be found (or rather, used to be found) at the Moogle Cavern with the same name? This follows the same concept: Tails is bored. So Sonic has to talk some sense into him at his base..? Looks rather funky. There are also demos of ‘Sonic Stash’ and ‘beyondSonic’. Worth a peek. Keera, a lone developer, has created a nifty game called Sonic: The Next Episode. No screenshots were released but I can tell you it is rather good. Mang Team have created a title known as ‘BaconX‘. Not a Sonic game at all, but has all the hallmarks of a random comedy game. It involves a guy named Dave Badluckett and his spirit bacon guide named BaconX, who instead of finding Garage ‘choons’ on his PC discover a virus. The bad script sets the two heroes a dastardly challenge, that they must overcome in order to get their computer files back. Sounds pretty funny – I’ll be keeping a close eye on this one, even if Sonic isn’t even featured. My very own pal Kulock has come to SAGE with a title called Sonic 3D [ABOVE]. Not an original name, I know, but the rest of the game is pretty inspired. The aim is to leg it, Sonic 2 Special Stage-stylee, and avoid the bombs. The demo includes the level ‘Sand Speedway’, which I’ve yet to play but looks interesting. Take a looksie at the screen. Nicho’s Minions have pulled their weight for SAGE, with four already-released games in their showcase (such as ‘Drunk Sonic‘ and ‘Blues Brothers S‘), as well as two games in production titled ‘Fat Sonic‘ and ‘Sonic Streak 2‘. ‘Fat Sonic‘, as you can pretty much guess, features a rather porky Sonic due to him not featuring in many games recently. The aim is to make him work out for his big debuts on other consoles. Not much info is released on ‘Sonic Streak 2‘, only revealing a story where Eggman obtains a ‘negative emerald’, and is able to capture people’s souls etc. Sounds cool to me. Sonic Ultra 3 is one of the titles that Gregorsoft is showing off here. The game is based off of a series of the same title. ‘Sonic Ultra‘ 1 & 2 is about Eggman attacking Mobius, as you do. ‘Sonic Ultra: The Return‘ involves Eggman putting work into his new Scrap Brain Fortress. So Sonic Ultra 3 has Eggman returning, with Sonic and Tails thinking he is dead. Forthcoming games include another Sonic Ultra game and a game called ‘Sonic Ultra Compilation II‘. Shadowsoft has a nifty little flash file on its page, which tells you about their new game – which itself seems pretty good by first impressions. More news as Dreadknux gets it. A secret fan game that has been in development for the past couple of months is called ‘Project:EGG‘ by Davie Slam [ABOVE]. Just like traditional Sonic games, the plot involves Eggman causing havoc, with Sonic out to stop him. Including a ‘static engine’, all the original power ups and moves, along with possibly even more additions, this looks to be the best put-together game at SAGE. Can’t wait. Sonic Team Junior is showcasing a project titled Sonic Robo Blast 2. A sequel to the first obviously. Graphically, this game is far and away the best I’ve seen at SAGE. Don’t ever think about not liking this game; I’ve played the demo and it ROCKS! This is the first Sonic fan game I have seen that has managed to pull off marvelous 3D graphics. The screen above just proves their achievement. I won’t be surprised if this was one of the best games voted in SAGE! A game that looks rather cool is a game called ‘Sonic 3D40 Vs Counterfeit‘ [ABOVE] by…. Sonic 3D40 of course. Starring eight different webmasters, absolutely nothing is known about the game except for screenshot releases and demos. A screen of the game in action can be seen above. TK Games presents a game titled ‘SONpc‘. At the time of Dreadknux going to press, no information was available about the new game, but I can tell you that it will feature a two player on top of the standard one player. Taxman is not to be left out, bringing to the table a game called ‘Retro Sonic‘ [ABOVE]. Basically, all the lost zones and re-vamped levels from old Sonic games have come together to make this, one pretty good looking game. You get to play ‘Dust Hill’ at last. Above is a re-vamped version of Spring Yard, called ‘Sparkling Zone’. Knux 9 has a collection of games on show that will be heading to your PC soon. 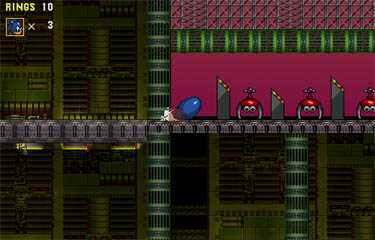 One of them, ‘Eggman Strikes‘ is your traditional Sonic game, featuring Sonic and Knuckles. A demo is available to play at SAGE. ‘Jet Set Speeders‘ is a Jet Set Radio-inspired game starring Sonic in Metro-to. ‘Sonic World 4: Ashura’s Menace‘, ‘Flugger & Knux 9‘, ‘Emerald Hunter‘ and ‘Clash Bro’s!‘ are the other titles being developed by Knux 9 and chums. XTeam have published information on a game that follows after Sonic Adventure, called ‘Sonic Generations: A New Beginning‘. We have been told that Sonic has to travel past cities of gold and lava pits to complete this new adventure. I am yet to play the demo, but it sounds very impressive. Nik Jam the Man has certainly been busy recently, as he’s been working on three new projects for SAGE, including Sonik Adventure, Sonic Exciter and Sonic Violator. 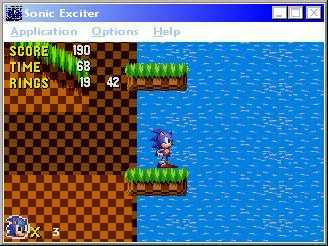 Basically Sonik Adventure is a Sonic game starring Nik Jam, Exciter is a Sonic game starring the blue one, and Violator has no info at this time. Dragonmind has ‘Sonic CCG‘ as its main priority at SAGE, which sounds like a Pokemon card game starring Sonic to me. Your aim is to be the king of the playing cards, and to do this you have to – yes, you guessed it – play cards with other people. Although initially it doesn’t sound that exciting, it sounds like there is a heap to do, with tons of levels being described and many opponents and heroes to play as. Should be fun after all. Chaos Corp has presented a new title after they canned ‘Sonic Warp‘ (which sounded great in the first place – a shame). Its new game ‘Sonic the Hedgehog: Chaos Factor‘ is set in 2010, where Mobius has been experiencing freak weather conditions and the planet’s core is at the threat of collapse, destroying everything in the process. Sonic’s job is to get the Chaos Emeralds and restore strength to the planet’s core so that it doesn’t self-destruct. It looks pretty tasty at the moment, we’ll see how it turns out. The last in the list, but certainly not lacking in games, is Diablohead who has three games on showcase. One is called ‘Sonic Team Arena‘, you can guess what that is about. The second is ‘Sonic S-V 2‘ [ABOVE], which Diablohead is saying will be released soon. Dreadknux can’t wait to play it. New features include a totally new engine to the first game and a layered background.